I've created a Butterfly card using the new and-oh-so-fabulous Creative Expressions Majestic Monarch Butterfly Craft Die by Sue Wilson. I love it for its beautiful lines Have you seen Sue's incredible NEW Spring Release? If not, do yourself a favor and go check it out the gorgeous craft dies HERE. Brand NEW craft dies from the Creative Expressions Spring Release. I'm totally addicted to Sue Wilson's gorgeous collections. All dies are quite elegant and seem to coordinate beautifully - so design combinations are endless. 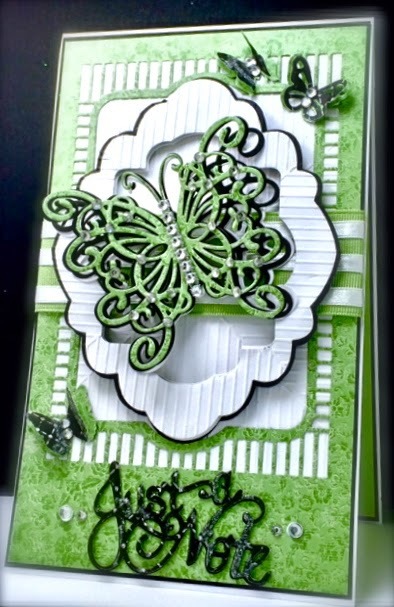 SCS- Featured Stamper - Challenge - Fs493 - Naomi W.
this is another fab and very beautiful card America. Evening America what a gorgeous card i'm with you on the Sue Wilson dies I adore them all. I have used all these dies on one card and mine is totally different to yours. It just show how they can be used in so many ways. Gorgeous card. I love the colour. Thanks for joining in our "Things With Wings" challenge at Crafty Calendar this month.